Cairo, Ill. lies at the heart of one of the fastest depopulating regions in America. On some streets, old mansions are abandoned and nature is taking over whole city blocks. Cairo Schools staffers barbecue hot dogs and hamburgers for students on the last day of school. Most of the units in the sprawling McBride housing project on Cairo's south side are now boarded up. The remaining families have until the end of June to move. Enrollment at Cairo Public Schools has dropped by 40 percent since 2012. But administrators believe the school has now plateaued, and they're hopeful for a rebound. On the last day of school in the rural town of Cairo, on the southernmost tip of Illinois, the fire truck ran its hoses so kids could cool off in the sweltering heat. The staff barbecued burgers and hot dogs. It was a light-hearted anecdote to what had been another tough year. After a precipitous decline since 2012, enrollment dropped by another 100 or so students. This year there were only 26 seniors in the graduating class. "It's been a lot of up and down, a lot of uncertainty," says Hope Green, who's worked at the school since 1998, most recently as its truancy coordinator. The district cut 14 teaching positions, though every effort was made to keep local Cairo residents like Green on staff. "To me it's like I'm losing a big piece of me, a piece of my heart," Green says. "It's like the town is steadily declining, never any good news really." For years, a slow moving disaster has enveloped large parts of the middle of the country with whole towns emptying out and drying up. No place better illustrates this than Cairo, a former river port and manufacturing hub whose economic troubles began with the decline in river trade. 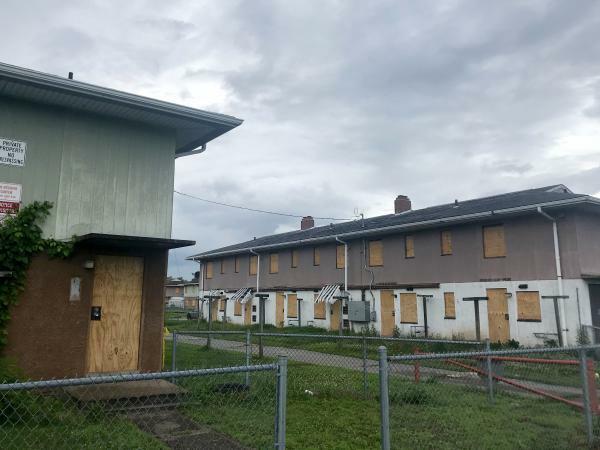 Over the years the town has also been plagued by corruption, racial tension and outright neglect, particularly when it comes to public housing. Now, only about 2,300 residents remain. At the end of this month, the federal government will shutter two large public housing projects where many of Cairo's remaining residents had lived. The decision by the federal Housing and Urban Development department followed years of acrimony between local housing officials and residents of the projects who complained about squalid conditions. HUD took over the local, scandal-ridden Alexander County Housing Authority in 2016. 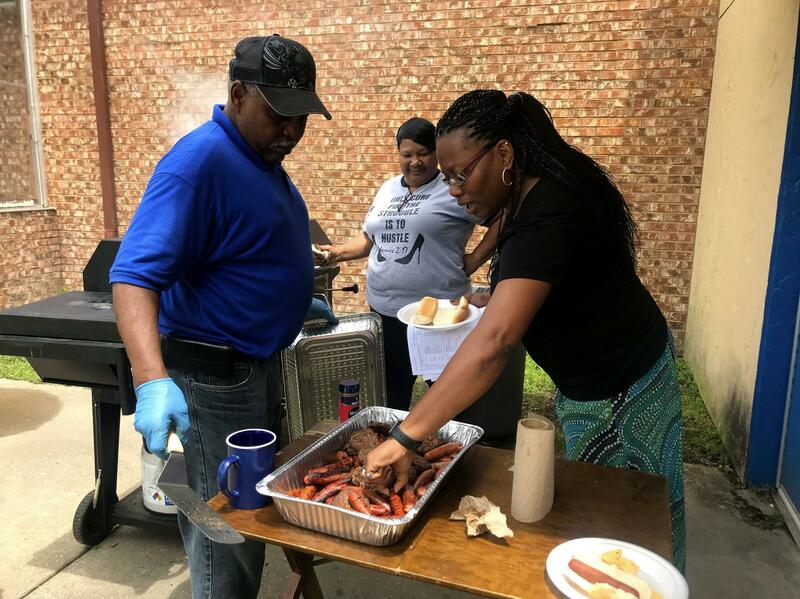 Last summer after the decision was made to close rather than repair the 1940s-era Elmwood and McBride projects, HUD Secretary Ben Carson traveled to Cairo and pledged to do all he could to find everyone a new place to live. A year later, HUD has spent more than a million dollars relocating families to other Section 8 rentals, a better use of funds according to the agency, than the estimated $50 million or more it would have cost to repair or rebuild the projects. While some 50 families were able to stay in Cairo, almost twice as many have had to leave. "At the federal level we're seeing that it's easier for the federal government to pull away from communities that have come on hard times," says Annie Evers, superintendent of Cairo Schools. Evers is saddened by this. After all, as people here will remind you, river barge towns like this once helped build America. Cairo is even immortalized in the writings of Mark Twain. In the last few years, Evers says the narrative has been, we're here to help people but not Cairo. "We're not seeing that commitment and that's deeply troubling because we're not in isolation," Evers says. "There are Cairos throughout the United States who are being forgotten because of this perception that the communities are not desirable." But how far should you go to keep people in a place where there aren't many opportunities? Towanda Macon, who is overseeing Cairo's public housing crisis for HUD, fields that question a lot. "I'm originally from a small town myself so I do understand the balance of wanting to maintain an environment in a small town and build your community," Macon says. But Macon also says other communities in the region such as Cape Girardeau, Mo. or Paducah, Ky. have things that Cairo doesn't: Boys and Girls Clubs, choices in health care, even something as simple as a grocery store. There are two Dollar Generals in town but neither carry much groceries, let alone fresh produce. Cairo's last grocery store closed in 2015 and promises to reopen it haven't yet materialized. "Hopefully we've been able to strike a very good balance of keeping the folks here who wanted to be here," Macon says. "And helping those folks leave who were interested in finding a new location and starting over." After a year of limbo, most of the sprawling public housing projects are boarded up. Weeds are taking over their playgrounds and basketball courts. It's an eerie sight. At last count, about 40 people still remained and could face eviction proceedings after this month, though HUD says it will work with families on a case-by-case basis to avoid that. Still, all of this stings for lifelong Cairo residents like Phillip Matthews who believe the town is close to getting out of a rut. Matthews is old enough to remember when the city had a population of more than 10,000 people and a vibrant downtown; long before its abandoned, crumbling old homes and vacant lots became a favorite of ghost town enthusiasts on social media. "You would never get me to believe that this city is dying," Matthews says, "I don't care if 3 or 400 people leave, we'll get 7 or 8,000 to move back." One humid morning, Matthews drove along a dirt road atop of a levy near the confluence of the Mississippi and Ohio rivers in Cairo. To the west was a large open field of undeveloped land where town leaders have long hoped to build a large port authority. The newly passed Illinois state budget included $1 million in seed money for the port, on top of an earlier $100,000 grant from a foundation run by Illinois Gov. Bruce Rauner. Even though it's likely years away from construction, if completed, the project could create hundreds of new jobs and mark a significant increase in truck traffic. 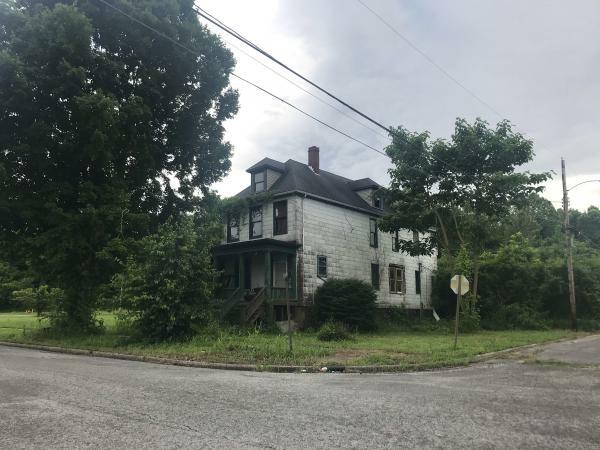 Town leaders say they're also close to inking a deal with a private developer to build new housing in Cairo, something that hasn't been done in a half century. "The reason I'm still here in the city is because I know what Cairo has the ability to become," Matthews says. 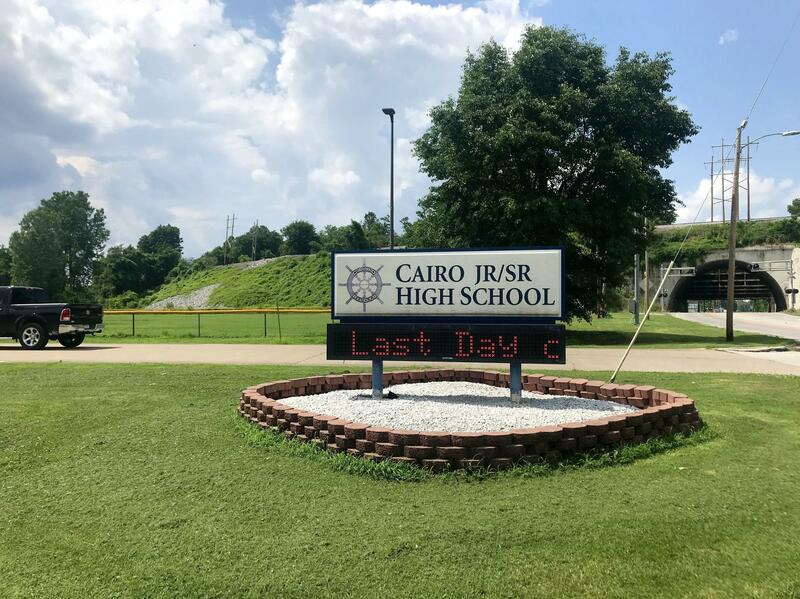 A year ago when it was announced that the projects were closing, many in Cairo feared that would be the death knell for the town, and that the school might be the next victim. But even as enrollment has dropped by 40 percent overall since 2012, administrators believe they've reached a plateau. And things haven't been as bad as everyone feared. The doors will open for another school year in early August, a relief to many. There are also a handful of success stories of people being able to stay and keep the town going. For instance, Nina Ellis, who lived with her two young daughters and 18-year-old son in the projects, found a rental house in town with a yard. It's on a quiet street with friendly neighbors, she says. "I don't worry about the girls as much as I used to being in the projects as far as the filthiness of the area," Ellis says. Their back-up option was to try to move back to California where Ellis grew up. But it was a last resort. In her eight years living in Cairo, Ellis grew to love its small town lifestyle. Everyone knows everyone. It's friendly and tight knit, even though there aren't many jobs. "Nobody cares about Cairo," Ellis says. "But they don't understand that this is a community of love, we all come together." Ellis landed a part-time janitor job at the school — by far Cairo's largest employer. And like in a lot of rural areas that are emptying out, as long as there's still a school, there's still a town.